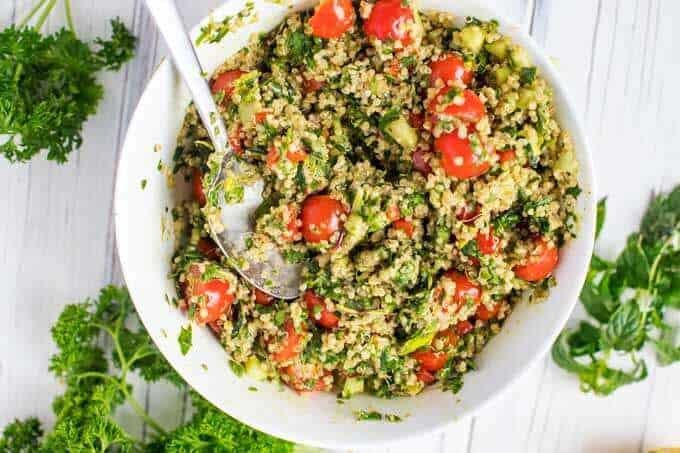 Quinoa Tabbouleh is a fun spin on a classic tabbouleh salad! I’ve swapped out traditional Tabbouleh for quinoa, which makes this dish gluten-free and adds a kick of protein. I’ve also added in spinach, for an extra pop of nutrition. This gluten-free and vegan recipe is the perfect make-ahead side, and also works great for a light lunch. For those with special diets, I’ve included low carb and oil-free versions. I grew up in Florida with parents that were very much Southern. In a culinary sense, my life was very sheltered. Dinners were dishes like fried chicken, mashed potatoes, and green beans. Or Pot Roast with carrots and potatoes. About the most ethnic food ever got around our house was lasagna made with Prego. There were so many things I never ate as a child. Asparagus, beets, avocados, and sauerkraut are a few things that come to mind. I was in my 20’s before I had Chinese or Thai food for the first time and it was even later that I had Middle Eastern Food. I guess that may be why I’m so comfortable making traditional ethnic food…well, less traditional. 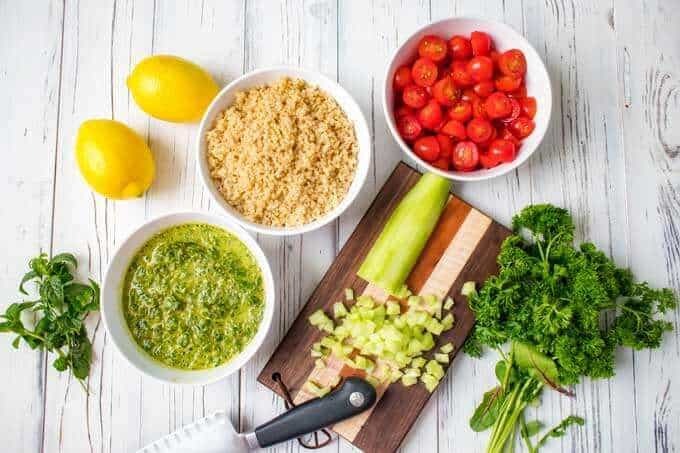 Tabbouleh is a Middle Eastern dish that is typically made with bulgur. A less traditional but still common alternative is to make it with couscous. It can be challenging to find gluten-free couscous (and obviously bulgur is not gluten-free). 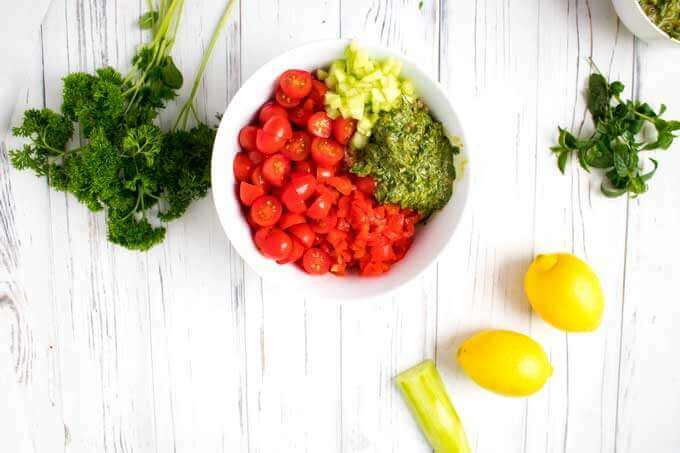 To mix this Quinoa Tabbouleh recipe up even more, I’ve added greens (I used power greens, but I’ve made this with spinach), roasted red pepper, and a touch of gluten-free tamari. 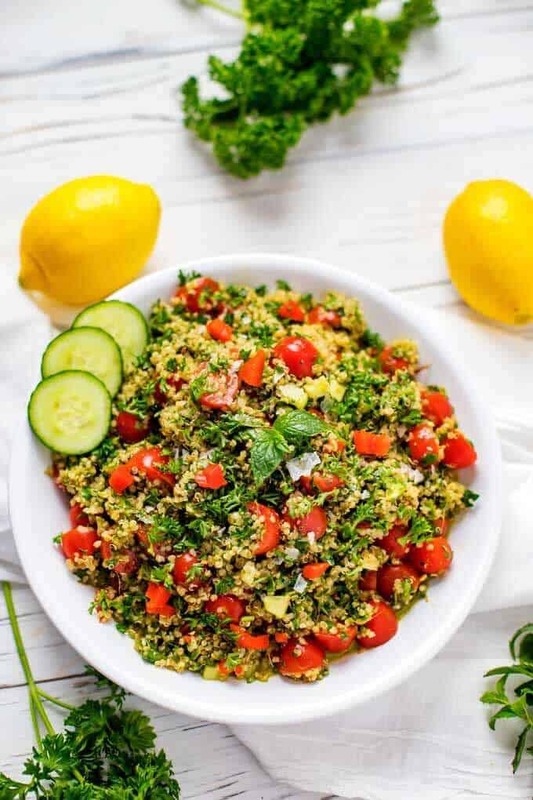 4 What Goes Well with Quinoa Tabbouleh? 1. If you are making this recipe oil-free, start by combining chia seeds and warm water. Stir well, and allow to sit for 10 minutes, until a gel forms. 3. Half the tomatoes, and chop the cucumber and roasted red pepper. 4. Add in garlic, lemon juice, tamari and either olive oil or chia gel. Pulse until well combined. 5. In a large bowl, combine quinoa, tomatoes, cucumber, and roasted red pepper. 6. Top with the spinach and herb mixture and stir until well combined. 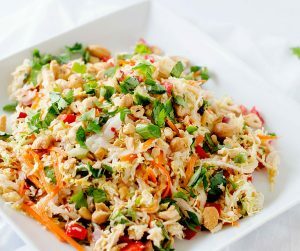 The result is a bright, fresh and flavorful dish that also happens to be quite versatile. It is a great side dish and also makes a nice vegan lunch served with hummus and pita chips. Today I enjoyed it with fresh spinach and sprouts in a gluten-free wrap! Add in 2 tablespoons tomato paste and 1 tablespoon harissa for a Turkish Tabbouleh. If quinoa isn’t your thing, try substitute brown rice or gluten-free couscous. Add 1 cup of chickpeas for an extra punch of protein and fiber. 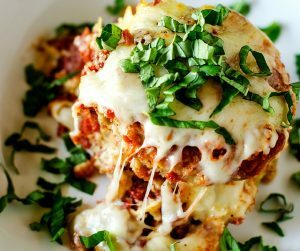 To make this recipe low-carb and keto friendly, use cauliflower rice in place of the quinoa. If you are trying to keep your carb count very low, reduce the tomatoes to 1 cup. To make this recipe soy free, omit the tamari and use coconut aminos. To make this recipe oil-free, follow the instruction #1 to use chia gel in place of oil. This Quinoa Tabbouleh is best after it has sat for a few hours to allow the flavors to combine. It is best served within 5 days. 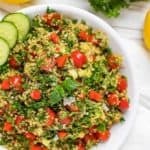 What Goes Well with Quinoa Tabbouleh? This recipe is excellent served with Lamb Kebabs or Lamb Meatballs. Use as a base for a bowl! I love it as the base for a Gyro Bowl. Serve as a side dish for Falafel. Serve as a side dish for Greek Meatballs. 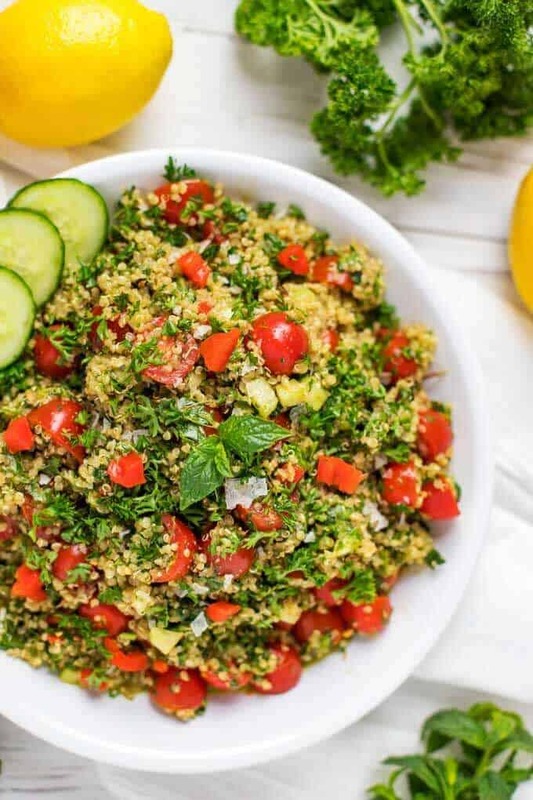 This Quinoa Tabbouleh Recipe is a deliciously healthy twist on a classic! Gluten-free and vegan, it makes a great side dish or light lunch. If using chia gel in place of oil, combine chia seeds and water and stir well. Set aside for 10 minutes, or until a gel forms. 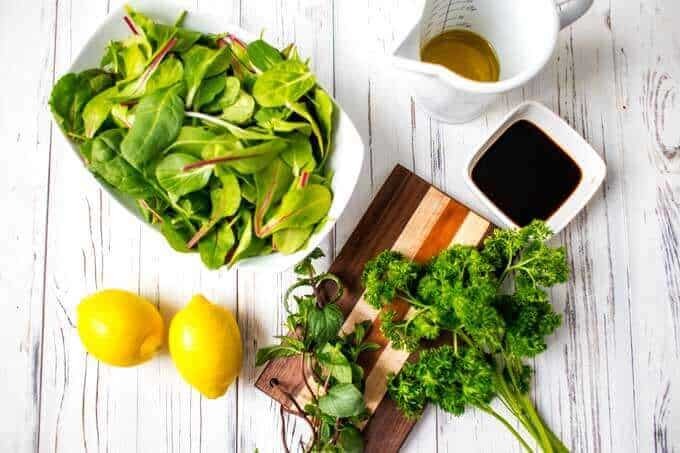 Combine spinach, mint and parsley in a food processor and pulse until chopped. Add in garlic, lemon juice, soy sauce or tamari, and olive oil or chia gel and pulse a few more times until well combined. In a large bowl combine quinoa, grape tomatoes, cucumber and roasted red pepper. Top with spinach mixture and stir until combined. This is a delicious AND healthy replacement! This sounds so good! There are so many different flavors all working together in that dish. It’s just the kind of dish I love. I love the interplay of flavors here. All the spice and cool mingling together sound mouthwatering. I’ll definitely be making this. This looks SO good. Your photos are beautiful as well! I think this is something my whole family would enjoy, I’ll definitely have to try it out! I have to make this! 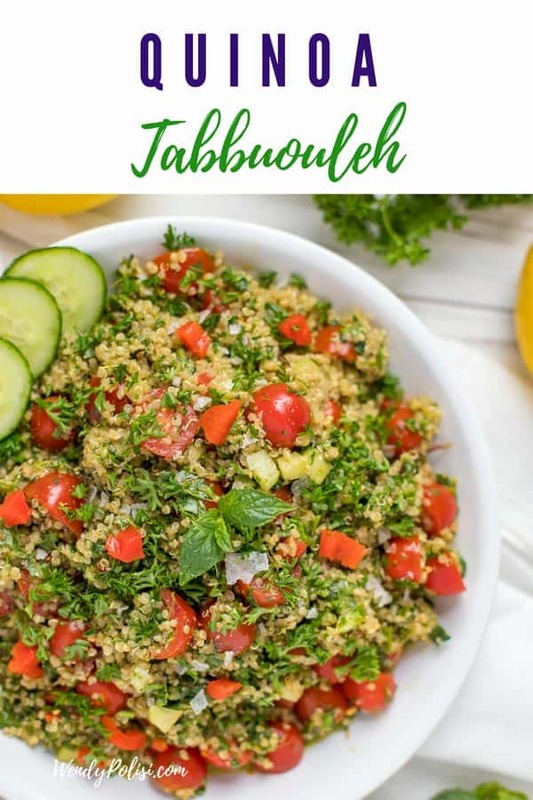 Tabbouleh is one of my favorite things in the world!! I an not a big fan of quinoa but this dish looks beautiful. Serving it with hummus and pita chips sounds awesome! This looks so yummy and fresh! Your pictures are so bright and make it look even more delicious. This Quinoa Tabbouleh looks like something I would love. I love healthy and fresh meals with a Mediterranean flavor! That looks so delicious and so healthy. I would love to have that for lunch. Thanks for the recipe! Thank you for sharing this delicious side dish! I am always looking for healthy alternatives! I dont think that I have had any Middle Eastern foods. Im thankful that I was introduced to a variety of foods growing up. My grandmother cooked more meals for us though. Now, I tend to make the same foods over and over. Recently, we got sick of eating over processed junk on a regular basis. Im trying to make more things from scratch whenever possible. My 6 year old doesnt like it because foods are mixed together in casseroles. He will eat the same foods if they werent mixed so its taking sone getting used to. I wish that I liked quinoa more because its healthy. Fyi, you might try looking at Aldi for gluten-free couscous. I made quinoa for the first time last week and now I am all about finding ALL the quinoa recipes! Thanks for this! YAY! I have over 600 of them on the website. Enjoy!